The Optimal-G™ Pro Gait Rehabilitation System allows natural physiological gait patterns while walking. It offers real-time video biofeedback through front and side cameras. The ELITE is embedded in the system for optimizing neuromuscular re-education and brain retraining and proactively adjusts. The system personalizes patient's treatment plan depending on objective clinical data and their individual progress. It provides the therapists with recommendations on correct adjustments based on the analysis of patient functional abilities. 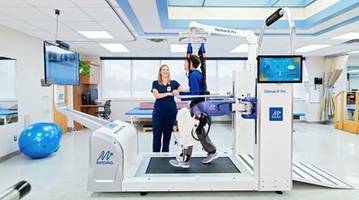 HAMILTON, Bermuda, Jan. 22, 2019 /PRNewswire/ -- As part of its continuing mission to provide innovative, state-of-the-art robotic-based rehabilitation solutions, Motorika will introduce the Optimal-G™ Pro [http://motorika.com/optimal-g-pro/], its most advanced personalized robotic gait platform, at the upcoming 2019 APTA Combined Sessions Meeting [http://www.apta.org/CSM/] taking place Jan. 23 through Jan. 26 in Washington DC. Motorika's most advanced gait rehabilitation product line, the Optimal-G™ Pro, introduces novel Enhanced Learning Intelligence TEchnology (ELITE) for optimal neuromuscular re-education and brain retraining. "Thanks to ELITE, the Optimal-G™ Pro enables rehabilitation professionals, for the first time, to offer a proactive motor learning technology that personalizes patient therapy and ultimately accelerates recovery," says Arik Avni, Motorika's co-CEO. The system is designed to allow natural physiological gait patterns while walking, and provides real-time video biofeedback through front and side cameras that offer superior visualization of each step to reinforce proper gait biomechanics. Integrating clinical principles of gait rehabilitation and motor learning with expertise in robotic technology, ELITE proactively adjusts and personalizes the patient's treatment plan based on objective clinical data and their individual progress. The system's innovative analysis of different patient functional abilities provides therapists with recommendations on the correct adjustments according to treatment parameters, enabling improved decision-making, progressing therapy programs and enhancing patient care. "The Optimal-G™ Pro has been a great addition to our therapy program," says Dr. Martin Rahn Setliff, Medical Director of Inpatient Rehabilitation at Our Lady of the Lake Hospital in Baton Rouge, La. "It engages and motivates patients in ways we were never able to achieve previously. The numerous settings and options have made this device beneficial to patients with a variety of impairments and functional deficits." Delegates at the 2019 Combined Sessions Meeting are invited to visit Motorika's booth #838 for a live demonstration of the Optimal-G™ Pro and other solutions developed by Motorika for both upper and lower limb rehabilitation therapy. "We look forward to presenting our complete solution for upper and lower limb rehabilitation," says Din Hadass, Motorika's co-CEO. "Our clinically-proven ReoGo™ upper limb robotic system is widely used by leading rehabilitation clinics and hospitals worldwide, and we are eager to provide the market with access to the Optimal-G™ Pro, a solution that significantly enhances our product portfolio." The Optimal-G™ Pro is now commercially available in the US and Motorika is accepting orders from clinics. Motorika, a Hobart Group company, is a leading robotic rehabilitation specialist whose mission is to empower neurological and orthopedic patients with the freedom to walk safely, be active, and experience the best of every day. The Optimal-G™ Pro is the most recent addition to Motorika's groundbreaking robotic rehabilitation solutions – the ReoGo™ for upper extremities and ReoAmbulator™ for lower limbs – that have assisted in over a million patient therapy sessions in hundreds of clinics and hospitals around the globe. Motorika's products are commercially available in 33 countries worldwide, including the US, Europe and China. For more information, visit www.motorika.com. The Hobart Group develops and commercializes medical technologies that target top healthcare markets with significant unmet needs. Its growing portfolio of companies covers the areas of cardiology, diabetes, oncology, neurology and rehabilitation. Together, Hobart Group companies have over 150 scientists, engineers, regulatory and business experts across four continents, benefitting from clinical expertise and extensive regulatory and international market knowledge across Europe, the US and Asia. For more information, visit www.hobart-group.com.